If you like different, eye catching designs and a much more colorful beach experience, Jacquard Peshtemal is a great fouta for you. Woven from 100% cotton yarns and weighting about 360 gr, this fouta is highly absorbent and light. The high quality of Jacquard Peshtemal makes it great for vacations, spas or a long, relaxing day at the beach. If you like to reflect your personality and have fun at the same time, with its uniqe design, Jacquard Peshtemal is the right fouta for you. Simplicity and relaxation… This is what you will find when you see Casanova Peshtemal for the first time. While its striped design makes you feel elegant, its soft colors will give you a cozy and comfortable feeling. One of our lightest Turkish Beach Towels, Casanova Peshtemal only weights 300 gr and it is woven from 100% high quality cotton yarns. That makes this Turkish Beach Towel not only extremely easy to carry, but also highly observant and durable. This Turkish Beach Towel will be an irreplaceable part of your daily life. Cutted Diamond Peshtemal is one of our newest hammam towels. It combines traditional stripes and fringes with more modernistic colors and gives you a great beach and spa experience. Like all of our hammam towels, Cutted Diamond Peshtemal is also light, absorbent and quick drying. Because it is woven from 100% high quality cotton yarns, it is also very soft which makes it a great hammam towel for all skin types –including sensitive skins like babies. This hammam towel will turn your vacations and beach experiences into unforgettable memories. After the ending of a work full of winter season, and with the arrival of a relaxing spring season we put our latest fashion, Turkish Beach Towels on the market. 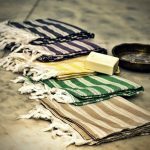 As a Turkish Beach Towel manufacturer and wholesaler, we reviewed four of our newest designs for you. Firstly, we want to provide insights about the features of the high quality Turkish Towels we manufacture and wholesale. Woven 100% from high quality cotton and dyed with harmless paints, Turkish towels we manufacture are completely reliable. We manufacture our products to be highly absorbent, quick drying, and durable for your comfort. Two of the most remarkable aspects of Turkish Beach towels are that they are thin, and light-weight. Due to their perfect texture, they take very little space in suitcases and backpacks, so you can easily take them to beaches, pools, yachts, hotels, hammams, spas, and gyms. With their soft texture and being woven and dyed with high quality and harmless material, you can confidently use the Turkish towels we manufacture and wholesale for baby care. Our designers always keep pace with the fashion and we offer you a wide color spectrum for all of the Turkish towels we manufacture. Thus, our products are elegant and eye-catching. You can proudly take the fouta we manufacture to your vacations. You can also use our fouta as lively decorative items in your bathroom. Whale Peshtemal is woven 100% from high quality cotton. It weighs 430 grams which makes it lighter than ordinary towels. Whale Peshtemal is highly absorbent, quick drying, extremely durable, and very soft. Due to its light weight and thin texture, this Turkish Beach Towel is easy to pack. One of our latest designs, Whale Peshtemal has lively drawings related to seas. We offer a wide color spectrum for this Turkish Beach Towel. One of our most lively Turkish Beach Towels, Whale Peshtemal will bring joy to a vacation well deserved. Hasır Peshtemal is also woven 100% from high quality cotton and weighs 430 grams. Highly absorbent, quick drying, thin and, lightweight Hasır Peshtemal is a comfortable hammam towel. Hasır Peshtemal has a traditional design. Strips combined with vibrant colors, and fringes with both ends is a traditional hammam towel. Hasır Peshtemal is perfect for you to take to a soothing spa or hammam session. If you love simplicity, Single Peshtemal is perfect for you. With its single-color design, it is a minimalistic fouta. Woven 100% from high quality cotton, and dyed with harmless material, Single Peshtemal is completely reliable. Being easy to pack, this fouta can be easily take to vacations. For those who like simplicity, we proudly offer Single Peshtemal but if you like combination of vibrant colors, Colorful Rainbow Peshtemal is perfect for you. It reflects the beautiful colors of an entertaining holiday camp. It is also woven 100% from high quality cotton and dyed with harmless material. Durable, highly absorbent, quick drying and, light weight this fouta will brighten your vacations. During the history, realizing how useful peshtemal is, people used them in their daily lives. Women used peshtemals in their kitchen as aprons, workers used peshtemals in fields, craftsmen used them in their workshops. Garnished peshtemals were used by the royal family and rich people. We don’t only manufacture and wholesale high-quality Turkish towels but respect its cultural and historical aspects. Our research and development team, in cooperation with our dedicated designers, keep working to expand peshtemals area of utilization. As a result, we are proud to offer you our comfortable blankets and Peshtemal bathrobes. Woven 100% from cotton, Waffle Blanket is extremely lightweight and comfortable. During the manufacturing process of Waffle Blanket, we use highest-quality raw materials, and cooperate with the best dye-house in Denizli. Its soft texture makes it perfect to use it in baby care. Waffle Blanket has a minimalistic and elegant design. It doesn’t only make your nights cozy and comfy, it will also be a perfect home decoration. Thanks to its perfect texture, Waffle Blanket is easy to wash, and dries quick. Not containing harmful materials, Waffle Blanket can be used in your bedroom, at hotels and for baby care confidently. It is a perfect partner after a bath. You will feel the softness of the Turkish Cotton on your body !! Woven 100% from cotton, Ocean Peshtemal Bathrobes are extremely light weight. Durable, highly-absorbent, quick-drying, and soft; Ocean Peshtemal Bathrobes are perfect for you to use it after a relaxing bath. Manufactured from highest-quality cotton, and dyed by the best dye house in Denizli, Ocean Peshtemal Bathrobe doesn’t contain any harmful material. Inspired by the pure beauty of oceans, Ocean Bathrobe has a soothing design. Easy to pack, and taking too little space in your suitcase, you can also take Ocean Bathrobe to your trips with ease. After adopting a sedentary life, people had attached importance to their privacy. To meet the need of being cleaned and to satisfy their need of privacy, many different civilizations started to build bathing buildings, also known as hammams. During the Seljuq and the Ottoman periods, Turks had built countless hammams on Anatolian territories. Cagaloglu Hammam, Suleymaniye Hammam, Cinili Hammam, and Cemberlitas Hammam, are the most famous Turkish hammams located in Istanbul. People started using hammam towels in the past. 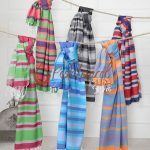 Coming to exist as the first clothing of history, peshtemal became connected to Turkish culture with the hammam culture. Being highly-absorbent, and quick drying hammam towel became irreplaceable in Turkish people’s lives. Not only in hammams, realizing how useful a hammam towel is, people started to use hammam towel in their daily lives. Garnished hammam towels were used by the royal family and the rich people of the Empire. Apprentices were given a peshtemal (hammam towel) as a symbol of becoming craftsmen. Women used hammam towels as aprons in their kitchen. Farmers and workers used hammam towels in fields. Today, as Peshtemal City, a manufacturer and wholesaler of hammam towels, with the hard work of our research and development, we offer you a wide product range. Woven from the highest quality cotton, our products are highly-absorbent, extremely durable and elegant. As a manufacturer and wholesaler of peshtemal, our research and development team and dedicated designers works hard to design the most elegant and comfortable products. Through our hard-work, Turkish hammam towels, bathrobes and blankets we manufacture are being preferred by the leading companies of Europe and North America. Our products are not only being used at beaches, spas, hotels, yachts, hammams, pools, gyms and homes but being given as gifts, or being used as decorative items during artistic projects. During the Ottoman Period, noblewoman used peshtemals garnished with gems and stylish drawings. As we respect the historical and cultural values of Turkish Hammam towels, we constantly follow the latest fashion to manufacture elegant Turkish Hammam towels. Therefore, along with their services, many cosmetic companies, furniture companies, and country clubs give our products to their clients as elegant gifts. We are proud to be a part of different industries. Our stylish peshtemals also make perfect decorative items for photo shoots, movies and advertisements. Photographers, movie studios, artists, and advertisement companies prefer our classy Turkish Hammam towels to create authentic backgrounds. We are proud of being a part of artistic projects. Manufacturing and wholesaling the most durable, comfortable and stylish peshtemals all around Europe and North America, we are proud of being preferred in many different industries. Are you wondering why you see Turkish Beach towel everywhere and everyone’s hand at the beach these days? And you are probably thinking how do people dry themselves with these unconventional towels, isn’t it a bit thin? 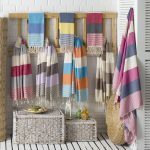 Actually Turkish beach towel also known as peshtemal is a product of a great tradition and history. For centuries it was used in traditional Turkish hammams, but with the developments and innovations in our time we have changed our habits in order to simplify our lives and sought for the products that is user friendly practical and fashionable at the same time. That’s when our traditional peshtemals made its comeback. And with our production principle they are fashionable more than ever! Peshtemals are not a thing from our past anymore. They have become a must-have at the beaches. And this has a very simple explanation! Our Turkish beach towels are super-light compared to ordinary beach towels. This makes it easier to carry around. It doesn’t weigh you down, your bags and your suit cases while traveling. And as we all know traveling light is priceless! Talking about priceless perhaps we should share the fact that our Turkish beach towels dry quickly if we were to compare it with an ordinary towel, plus the structure of the fabric is designed to be highly absorbent. So you no longer have to feel uncomfortable because of a wet towel that doesn’t during the days where you spend a lot of time at the beach. And these features make our peshtemal beach towels irreplaceable and savior of the time we spend at the beach. Everyone desires to look good and lively at the beach. In the recent years beach fashion changed and our Turkish beach towels replaced the ordinary looking, heavy and not so user-friendly towels as we offer a wide variety color spectrum and designs! Along with elegance we offer you quality and bring comfort and color to the beach fashion with our soft, vibrant, user-friendly and light-weight beach towels. For those reasons our peshtemal beach towels are highly useful in our time. It is practical. Remember those times that you had to bring a bunch of towels weighing you down in order not to wait for hours for a towel to dry up causing stress and ruining the quality time you were planning to spend at the beach or on your vacation. The times have changed! So let’s grab our peshtemal, head to beach and you shall notice the difference. Peshtemal, also known as fouta, which represent the best features of Turkish Culture in any aspect of life, have a solid 700 year history. Back in the 14th century, when foutas first appeared in the stage of history, producing one single fouta would take weeks and even months. Every loop was weaved one by one by the greatest craftsmen of the era in handlooms which were powered nothing but labor force. Best quality of cotton and the finest madder were used during the production process. Today, the production process slightly changed. Thanks to automatic looms and weaving machines, mass production became possible. The only thing that didn’t change since the 14th century is our sense of quality. We, as the Peshtemal City, still use the finest staple to be able to provide our costumers with the best quality and the best price. We have two different departments and over seventy employees. Operating over sixty Switzerland Sulzer Looms and four jacquard looms, Peshtemal City can produce 3.000 – 5.000 peshtemals daily. We have seventeen employees working in 3 different shifts, just for our hotel textile products. Three Dooby Looms and six Jacquard looms are operated during the process, which can manufacture around 30 tons per month. We are also working with contract manufacturers who can supply us around 20 – 35 tons per month. For the manifucturing process, we are working with the biggest and most qualified dyehouse in Denizli and the masters of their domain, just to make sure that we can provide our costumers with the highest quality of foutas with the shortest amount of time. Our sense of quality has been rewarded with an OEKO-TEX certification. Thanks to our qualified personnel and hard work of our dynamic research and development team, we are producing not only the best quality peshtemals but also bathrobes, towels and blankets and we are making peshtemal an irreplaceable part of our customer’s daily lives. We manufacture highest quality Turkish Towels for the leading trademarks of Europe, Northern America and Australia. Our peshtemals have the most durable and absorbent texture which makes it perfect for everyday usage. 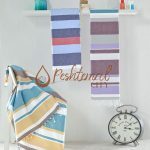 Peshtemals are replacing normal towels irreversibly in beaches, spas, hotels and even in our homes, and we, as the Peshtemal City, are more than proud to be a part of it. first Turkish Hamam, which is a public bath, was built in the 14th century. Hamams had hot water and steam rooms for bathing. But they were not only for that. Back in the day Turkish Hamams also provided socialization. They were places people went to meet friends and get to know new people. Peshtemals, also known as Hamam Towels, were the main materials used in Hamams thanks to their ability to dry very fast and easy maintainance. They came side by side with Hamams which makes peshtemal almost 700 years old. So just like Hamams, peshtemals also has a very important place in Turkish culture. g and after 17th century, peshtamals were made in wide range of colors and unique styles. After that, they became a symbol for both fashion and utility. With the continuing Hamam culture and expanding using areas, Turkish bath towel is gaining even more popularity every single day. They are used being used at hotels, spas, hammams,yatchs, and as decorative items at homes. ble, absorbent and elegant peshtemals, bathrobes, towels and most comfortable blankets for our customers. And as a part of our job, we want to inform you about the historical and cultural significance of peshtemals. Be sure to follow our blog to learn more about. 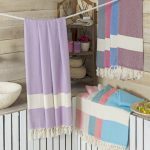 About peshtemal, also known as hammam towel or Turkish towel, which had different usage purposes, can be used in a wide variety of things nowadays. Peshtemal was used as a hammam and bath towel in the past. Now it is being used especially in sauna, spa, pool, hotels, beach and gym, fascinating people with its stylish visuality and comfortable usage. 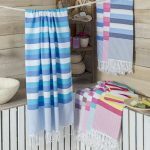 Peshtemals, took the place of the ordinary towels as it is better at absorbing water, more stylish, dries quicker and lighter.These features combined together, Turkish towel easily attracts consumers. Peshtemal offers an alternative option with various designs, elegant visuality, and numerous color options. We often see peshtemals at beaches especially in recent years, lights up the users and beaches with its colors and elegant patterns. It is trip-friendly, you can easily take it to the beach with you as it covers a little space in your backpack and easy to carry around. Turkish beach towel fascinates the consumers with its special features; it dries quickly, doesn’t weight your bag down, and is colorful. Peshtemal manufacturers have not only been limited to the beach, sauna and gym, by developing their product range well in the direction of increasing demands. Also in home textile they created different concepts such as peshtemal bed linen, peshtemal pillowcase, peshtemal tablecloth, peshtemal bathrobe, peshtemal dress, peshtemal bag, etc. Women are wearing different patterned peshtemals as daily clothes. In summertime we often see ladies wearing peshtemals. It has become an all-time piece for summer as it keeps its wearer cool in hot summer days, and is comfortable. With the increasing demand for it, Hotels and Spas started to use peshtemals in their facilities. It has become the number one product of the spa and hotels, especially due to its high water absorption capacity, its light weight and it covers less space than a normal towel. With the increasing interest in peshtemals, the sales are enjoying a boom in the domestic and overseas markets in recent years. Turkish peshtemals are renewed day by day with increasing product potential and quality.